A Dog To Remember – Comfort for those grieving the loss of their dog…. Also available at Barnes & Noble in Enfield CT, and Somersvillage Gifts, 111 Main St., Somersville CT. Loyal and fun, dogs give us companionship and unconditional love. They motivate us, bring us together and teach us about life and death. Each has a unique personality. The bonds we build over years of living together are strong. They are part of the family, and we miss them when they are gone. Anyone who has loved and lost a dog knows that the grief that follows can be powerful. For many people, their closest companion is gone. Their daily routine has changed; the house is suddenly silent. There is no exuberant greeting at the door. Evening walks and play dates with friends and their dogs fade away. 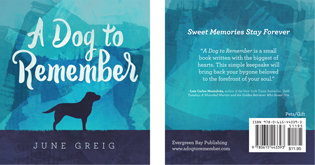 A Dog to Remember is a gift book that reflects on life with a dog and how memories of good times together will last forever. It is designed as a remembrance to help lift the spirits of the recipient, and to acknowledge the depth of their loss. The 54-page book is written in simple verse with black & white illustrations. Published by Evergreen Bay Publishing, the book includes a page to personalize by writing the name of the dog being recognized. Nominated by the Dog Writers’ Association of America for the Maxwell medallion for excellence in the Human/Animal Bond category.